Holiday shopping is crucial to paid search advertisers. How can you make the most of it? We found some insights and tips to improve your paid search performance. Ready or not, the holidays are here! Black Friday is only three days away, which means it’s the most wonderful time of the year to get your products in front of millions of shoppers searching for the perfect present at the perfect price. Recently, we read an article on strategies for making the most of your paid search campaigns this holiday season. And the findings may surprise you. Bing Ads data reveals majority of us are procrastinators. Shocker, right? What you may not know is that Black Friday and Cyber Monday only make up a whopping 17 percent of all holiday sales. Forty percent of gift purchases are made after these big days. So what does that mean for you? Don’t blow your budget. You still want to save a decent chunk and bid early to get the Black Friday and Cyber Monday sales, but you also want to save a little for sales throughout the season. That includes pre and post-Christmas! Set up automated rules and alerts to track ad spend in real time. (This allows you to have budget to spend to win sales late in the season). Make sure your titles include all relevant details like brand, size and color. Don’t forget about character limits, and test the order of product attributes to determine what works best. While some of us are holding on to the last bits of Indian Summer, lots of early birds are searching and buying well before Thanksgiving. 30 percent of holiday purchases are made year-round, and 9 percent are made in the weeks before turkey day. What does this mean? You need to plan earlier and have your campaigns ready by early November. If you’re still working on them now, sorry sister, you’re late. In November, your early birds and non-procrastinators are researching their upcoming purchases. Leading up to Thanksgiving, you’ll want to focus on building brand trust by making it easy for searchers to access product reviews and comparisons. Remarket! They already came back to look; make sure they return when they are ready to buy. In the era of “treat yo self,” self-gifting is at an all time high. 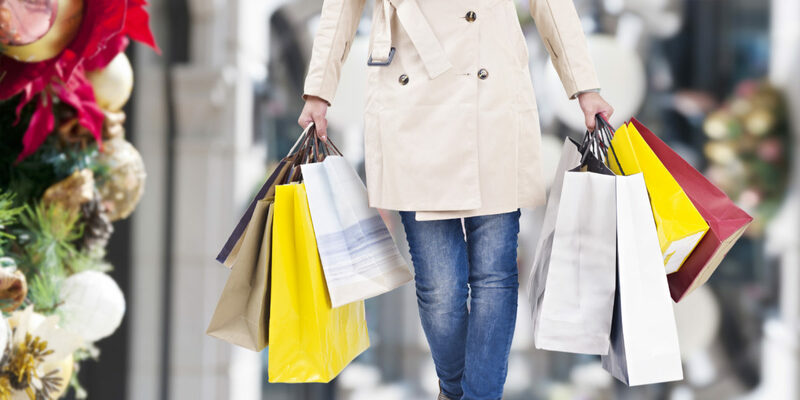 People shop for themselves about 70 percent of the time during their holiday shopping spree, especially when it comes to apparel. Something about putting on a new dress or new shirt for Christmas dinner just feels right, doesn’t it? Test out self-gifting ad copy for popular self-gifter items. Like dinner, search is hot on Thanksgiving. Shoppers are gearing up, scouring the internet as the plan their Black Friday attack. What are they searching for? Deals, duh. The week leading up to Thanksgiving, showcase your upcoming deals. Then, on Black Friday, make it easy for customers to find your store and coupons. Countdown ads show a sense of urgency for limited-time offers. Make it easy for shoppers to find your nearest location to their mobile device. So what are you waiting for? Time to get your product in front of shoppers. The holidays are literally here!